Win a Gift Card and Save $$$ during TpT's Cyber Sale! Yours so you can buy a great deal more!" Have you heard? TeachersPayTeachers is having a Cyber Sale on Monday and Tuesday, November 26 and 27, 2018! Everything in my TpT store, The ESL Nexus, will be 20% off their regular prices. Plus, when you use the discount code CYBER2018 when you check out, you'll get an additional 5% off for a total savings of up to 25%. And scroll down for your chance to win a $10 TpT Gift Card. Woo hoo! I've just created a new holiday resource, Christmas & Chanukah Word Search & Crossword Puzzles that you might like. You can use it to teach vocabulary about the holidays or use it just for fun when you and your students need a break from the holiday craziness. Or you might be interested in my other holiday resources. There are multilingual signs with holiday greetings in many languages that will give your classroom an international flavor; fun color-by-number activities that let students demonstrate their writing and math skills; and task cards to review the if...then grammar pattern. You can do a search for these individual products or click on the Seasonal Custom Category in my store to more quickly find them. You can also stock up on resources for Chinese New Year, Black History Month, and Women's History Month. Check out my China Bundles, each with a variety of resources; my African-American Biography Task Cards, which provide info about 80 famous people and give students writing practice; and my Women's Biography Task Cards, with info about 68 famous women that also give students writing practice. 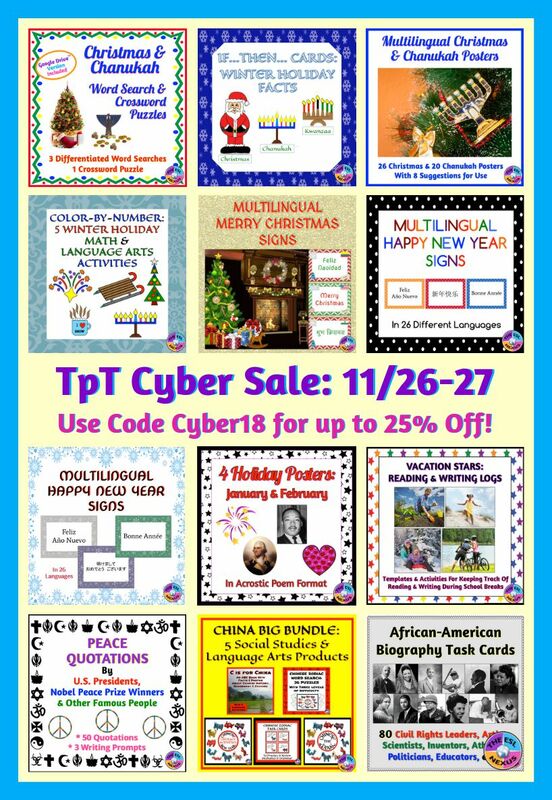 Just remember to use the promo code CYBER2018 when you check out -- I was so excited during a couple of previous TpT sales that I forgot. But wait – there’s more! :-) I have a TpT Gift Card for $10 to give away! The entry form is below and there are several ways you can enter: By following my TpT store, The ESL Nexus; downloading and commenting on 1 of my free resources; commenting on one of my blog posts (preferably not this one but it's okay if you do); following 1 or more of my Pinterest boards; and/or following me on Twitter. I ask that you email me to confirm your entries; your email address will only be used for this raffle. I will randomly pick a winner on Monday, November 26 at 9:01pm Eastern time. The winner will have 48 hours to reply and then I'll send the gift card so you can use it during the sale before it ends Tuesday night. But even if you don't win the gift card, I will send all participants who confirmed their entries a resource from my TpT store. So everyone wins something! And also remember: When you leave feedback on a paid product in the form of a fair comment and rating, you get credits that reduce the cost of your future TpT purchases.